Tuition Fees are £9,250 per year. You may be eligible to apply for a student loan from Student Finance. Please see our Tuition Fees page for more information. You may find it beneficial to invest in additional equipment and/or study resources to support your learning. Additionally, there may be the option of attending events outside of Futureworks which would further enhance your studies. We recommend that you budget in the region of £300 to £600 over the duration of the course to cover these expenses. To be considered for this course, you will require 104 UCAS points. If you’re unsure how many points you have you can use the UCAS tariff calculator. 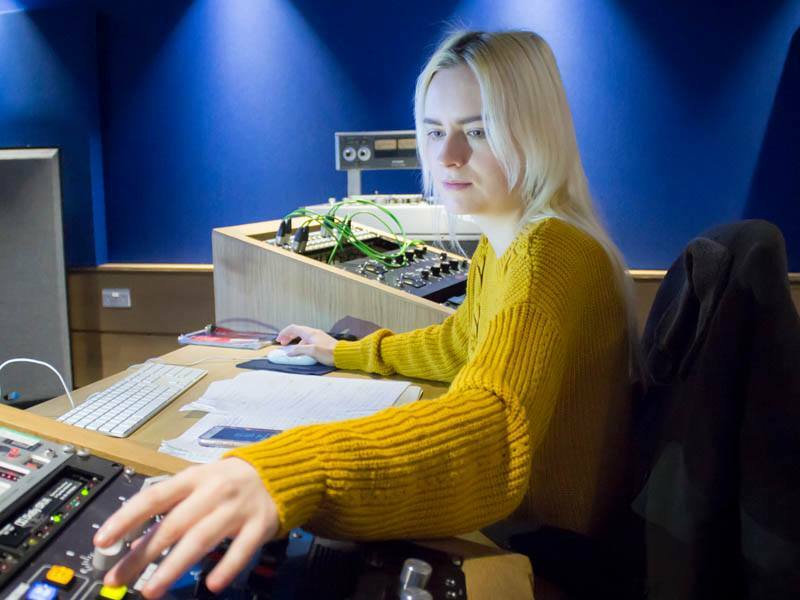 Remember that qualifications such as Graded Examinations in Music Performance and Arts Award (Gold) can also count towards your UCAS points – check the tariff calculator! Applicants are expected to have at least a ‘C’ in GCSEs Maths and English. Non-UK applicants will need to have an English Language qualification at International Level B2 or higher, such as an IELTS of 6.0 or better (with no component below 5.5). Students with equivalent qualifications will also be accepted. If your application is successful, you will be invited to an interview where you will have the opportunity to talk about your work, influences and interests. Ideal applicants will have a keen interest in sound, music and technology. You are welcome to bring any relevant examples of work with you, if you have them. For information about applying in July and August, please see our Clearing page. Futureworks is currently unable to accept any applications from anyone who requires a Tier 4 Visa to study in the UK. If you have any questions about applying for a degree course please call us on 0161 214 4602, email admissions@futureworks.ac.uk or look at our Admissions FAQs. Futureworks maintains a Student Protection Plan which has been approved by the Office for Students. The plan sets out the actions Futureworks will take, in co-ordination with its validating partner, the University of Central Lancashire (UCLan), to ensure that students are protected in the event of a material change to Futureworks’ operations. A material change may include the decision to close one or more courses, or a decision to cease operations altogether. A material change may, however, be triggered by decisions taken outside of Futureworks control, such as loss of designation/registered status with the Office for Students, or the decision by a validating partner to not renew the delivery one or more courses. You can download a copy of the plan here. If you wish just to cancel your application to Futureworks, you can do this by logging into your UCAS track and cancelling Futureworks as a choice. You can only do this if we have not yet sent you an offer. If we have sent you an offer and you wish to cancel your application to us, you can reject the offer on your UCAS track. If you accept your offer and then decide you wish to withdraw your application to us, you will need to call the Admissions department on 0161 214 4602 and ask them to release you from your offer.